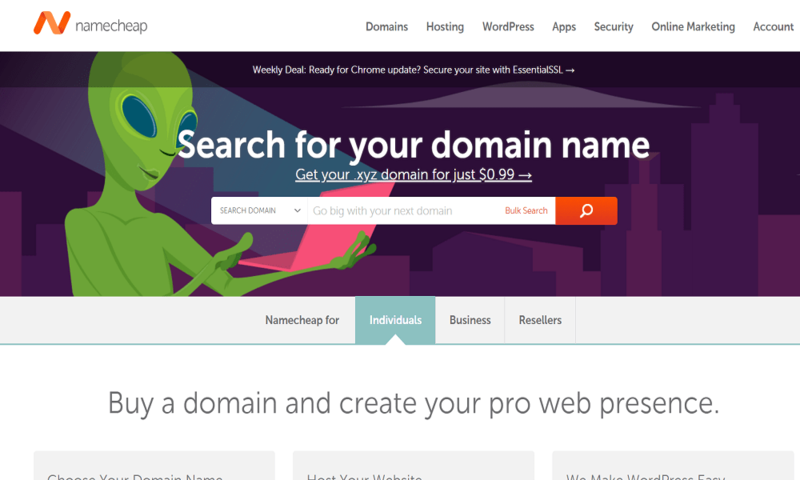 NameCheap Review 2019: Is NameCheap a Good Hosting? Namecheap has come from outer space to make hosting solutions affordable for all humans. Choose from incredibly affordable managed WordPress or shared hosting solutions as well as flexible dedicated server resources. Namecheap was founded by Richard Kirkendall as a domain registrar in 2000 with the mission to give everyone access to a domain on the internet. Naturally, Namecheap started to incorporate hosting products as part of their business and now offer almost all types of hosting starting at extremely affordable prices. Managed WordPress hosting: Have a dedicated technician look after your WordPress website/domain and server 24/7. Free or PremiumDNS packages: Depending on your budget, you can choose the enhanced availability and security of VeriSign-powered PremiumDNS. App Marketplace: You can easily install extra features and functionality to your hosting solution such as G Suite, Weebly, or EasyWP. As you can see from their space-themed website, Namecheap puts a lot of emphasis on being modern, fun, and accessible. You will be able to manage your domain or website using either cPanel or WordPress (or both) which are both fantastic platforms and possibly the best in their respective categories. If you want to migrate your domain, their technical support staff will take care of it for you. Installing apps is also done with only a few clicks. Managed WordPress hosting: Their 24/7 managed WordPress hosting is the most affordable product. However, it comes with a few limitations, such as a single website per plan and only 10 GB of storage. Reseller hosting: These products are for those who want to manage websites on behalf of clients and is divided into three products that differ in storage space and number of websites. There are also a number of VPS hosting and dedicated server options. When it comes to customer support, you can reach out either via 24/7 live chat or by submitting a ticket. The response times for live chat is usually very good. However, sometimes it’s frustrating trying to solve an issue with text correspondence instead of on the phone. The customer support staff is usually eager to help you solve a problem quickly. For those who want to run their own website without major requirements, the shared hosting or managed WordPress hosting options should be very appealing. You can also opt for either U.S. or U.K.-based servers based on your needs. However, Namecheap is not the best if you require large-scale server infrastructure. Wondering how NameCheap stacks up against other Web Hosting companies? Enter any other Web Hosting company and we will give you a side-by-side comparison.